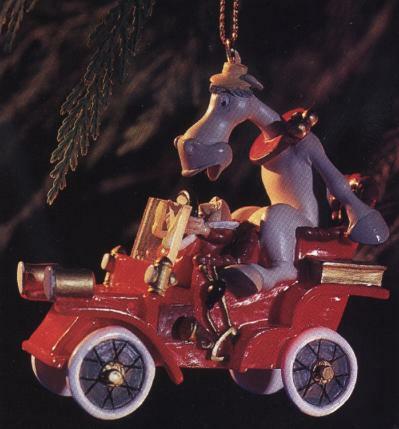 Ralph Kent's ornament portrays Toad and Cyril as they go "merrily on their way to nowhere in particular". It's $15, Item Number 15329041. To order, you can try calling 407.363.6200, but, last we heard, they're all sold out. It also says Ralph Kent, as well as designers of the other ornaments in this series, were to appear at The Art of Disney Gallery at EPCOT on December 8 and 9, 1998 from 2:00 - 6:00pm. They have also been spotted at a shop in the Contemporary hotel. If you missed these the first time around, this might be your last chance, so act fast. Good luck!